When is the Far Cry: New Dawn release date? We certainly weren’t expecting a new entry to the open-world series so soon after we took on the Seed family and their nefarious cult exploits last March. SPOILER ALERT: once the bombs dropped at the end of the game – that’s provided you got the ‘good’ and now canon ending, we thought that would be our first and final visit to our new favourite US holiday destination. It turns out we were wrong. Far Cry: New Dawn takes place on the same patch of American land that we already raised hell in in the previous game, but it looks very different now. 17 years after the bombs dropped in the canon Far Cry 5 ending Hope County has been taken over by Mother Nature. After a nuclear winter subsided, a ‘super bloom’ of violently bright flora carpeted over the sights and landscapes we explored in Far Cry 5. Far Cry: New Dawn doesn’t just look different: there’s even more to do in the American west than ever before, especially if you love making things explode or stealthing through outposts in co-op. In your fight against Mickey and Lou – sister antagonists leading the evil Highwaymen – you have a home base and missions that take place outside Hope County, too. Here’s everything we know about Far Cry: New Dawn. Far Cry: New Dawn’s release date is February 15, 2019. That’s quite surprising given that that comes within 12 months of the previous instalment, but we’re not going to say no to more Far Cry. Of course February of next year is an extraordinarily busy month, so we’ll have to wait and see if that’s a release date that sticks. We already know how much this new Far Cry game will cost, too: it’ll be 45 euros. That’s about £40 and $50 for English and American buyers, respectively. Interestingly, that puts Far Cry: New Dawn as neither an expansion nor a full-fat triple-A release, but somewhere in the middle. Just as we saw with Primal in 2016, New Dawn is the latest experimental entry in between more traditional, numbered releases. Before Far Cry: New Dawn was announced at the Game Awards 2018, Ubisoft sought to whet our post-apocalyptic appetite with the teaser trailer above. In it we hear from who is presumably a survivor of the cult-engineered nuclear fallout as he describes the aftermath of the bombs on his homeland. Lashing rain and whipping wind gives way to the ‘Super Bloom’ that enlivens the world with bright, beautiful flowers. The end of the trailer hints at the Highwaymen, a decidedly less pleasing addition to Hope County. Fans were a little annoyed when they pointed out the similarities between the worlds of Far Cry 4 and Primal. This time, however, the Far Cry: New Dawn map is the same as Far Cry 5’s for narrative reasons. You are still technically exploring the same patch of America, but it’s a very different place when you return 17 years later. Nature has restated its claim over Hope County, smothering the remains of this once-tranquil world scorched by nuclear bombs. In the years that have passed, however, Hope County is even more vibrant than ever before thanks to the ‘super bloom’ of flowers and vines that now coat the points of interest you remember from Far Cry 5. 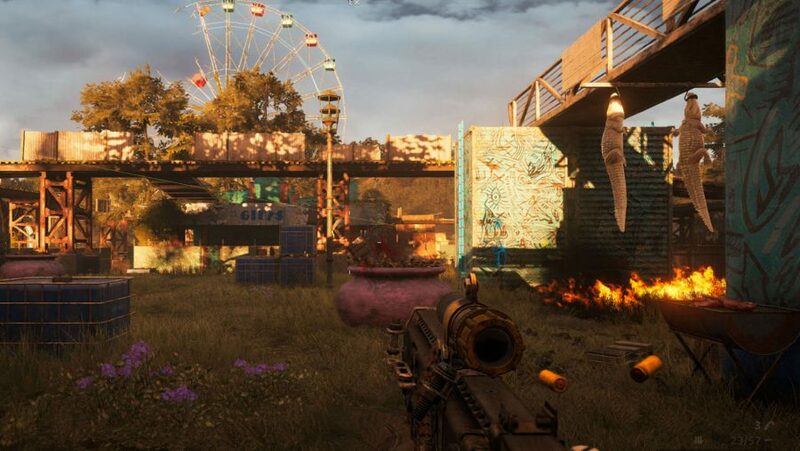 The Far Cry: New Dawn map might ostensibly be the same, but there’s certain to be plenty of post-apocalyptic surprises to uncover. While there are standout gameplay additions to this new Far Cry game, veterans of Far Cry 5 will know the score here. It is up to your mute protagonist and his group of friendly – or at least anti-Highwaymen – survivors. As you did with the resistance in Far Cry 5, you will need to acquire and battle for resources to increase the strength of your allies. Ultimately you’ll be strong enough to band together and defeat the Highwaymen. Outside of the main campaign, there’s loads of activities to be getting on with either with a friend or with the brand new Far Cry: New Dawn specialists. First, there’s the Escalation system which makes your outpost battles even more fun. Once you’ve sent the resident Highwaymen packing, you have the choice to either take over the base, or pick it completely clean for the most resources. The catch, however, is that the Highwaymen will move back in, and bolster their defences even more. If you repeat this process you’ll get even more precious materials, and facing even more powerful buddies is fun, too. Far Cry 5 shined brightest when you could ride plans, drive vehicles, and blow sh** up with a friend. New Dawn takes things a step further with outposts that increase in difficulty and high-stakes raids outside of Hope County. Speaking of bases, you have your own this time, called Prosperity base. This repurposed version of John Seed’s ranch from Far Cry 5 is essentially your home in New Dawn. Here you can heal wounded Guns or Fangs for Hire, store your favourite vehicles in the Garage, and gather intel to work out your next target. As you progress through the game, other survivors will be attracted to your place of relative safety, and they’ll bring laughter, songs and lots of lovely cheer to make your experience of nuclear fallout just that bit more bearable. You can also pick up Expeditions from Prosperity base. The limited but challenging missions take you out of Hope County by helicopter to give you the chance to see the devastation across the wider world. We know that there will be west coast and bayou areas to explore, but within them you’ll find nails-hard missions that will test your stealthy or soldiering skills. We’ve seen an Expedition that takes place in a disused theme park, and there are plenty of different avenues to take it from the bad people however you see fit. Each Expedition has more difficult versions of it with some featuring the heavily-armoured, tank-like Enforcer enemies. Far Cry games are arguably best known for their stellar antagonists. Vaas Montenegro lectured us in his terrifying manner the definition of insanity. Joseph Seed tried to tempt us into his cultish fold with his unnerving charm. 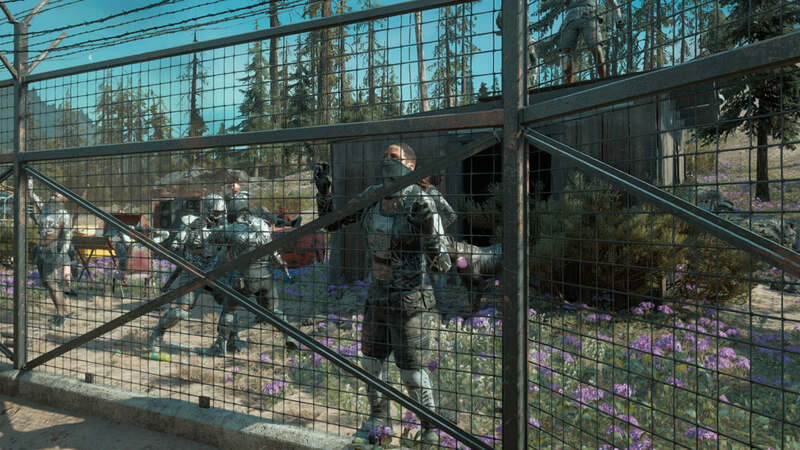 In Far Cry: New Dawn, the Highwaymen are led by the bleach-blonde sibling antagonists, Mickey and Lou. Following in the footsteps of the cult that brought about the world’s oblivion. With makeshift weaponry and armour fashioned from old Motocross gear, these murderous bandits will stop at nothing to utterly dominate this new, charred Hope County.